Part of the requirement is to put plans in place for what should happen in the event of a breach. Whilst electronic data security has been top of mind for many organisations for many years, the security of paper based personal data is often neglected or overlooked. Paperwork still accounts for many common security breaches. Statistics indicate that around 40% of data breaches will be paper based. Introducing clear rules about the use of paper documents containing information about an identifiable person and their personal data – defining what is ‘personal’ – and then the process for correct shredding of documents – based on the sensitivity of the data contained – is the first step towards compliance. A clear and firm document shredding policy is required supported by robust GDPR compliance process. A lot of the GDPR obligations placed on businesses are common sense and should already be in practice in companies with solid data privacy and protection processes in place. 1. 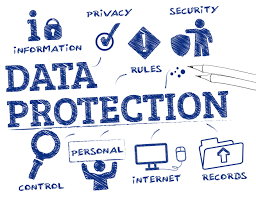 Appoint a Data Protection Officer – keep records of all data processing activities performed by the company. This officer must be fully commensurate with the organisation’s responsibilities regarding GDPR and have a thorough understanding of what data within your organisation counts as ‘personal’, where it’s kept, who has access to it, how to spot breaches when they occur and who to report this to. The Data Protection Officer doesn’t have to be an employee – you can outsource this function. 2. Assess your systems – Review all contracts, technology support, procedures and tools that relate to the processing, handling, storing and deleting of data to enable you to identify any weaknesses or gaps that require changes to be made. 3. Develop a strategy – Construct a new strategy that will ensure full compliance with the GDPR. This strategy may encompass new investment in technology, revise staff procedures and responsibility for data processing, create new roles within the organisation. 4. Implement a new organisation policy – The next step towards GDPR compliance is to put your plan into action throughout all levels of the organisation. Invest and introduce new technologies and systems required in the workplace and publish an informative data handling and processing guide. 5. Employee engagement – Launch your new data compliance policy to all staff; provide training, information and guides to employees so they are educated and aware of the changes taking place and their responsibility in ensuring that the company meets the requirements of the GDPR. 6. Review and improve – After launching your GDPR compliance plan, now is the time to review and improve before the regulations come in effect. Identifying any necessary improvements well in advance of the GDPR’s deadline, once May 2018 arrives your organisation will have successfully and efficiently adapted to the changes and be completely compliant. The amount of people setting up and growing their own businesses increases more and more. Due to all the startup businesses, the demand for small offices has risen. Often you have to cram all your necessary furniture into one tiny space, the results can feel claustrophobic and anything but restful. But a small space doesn’t mean you have to be cramped. Try these 5 easy room-expanding tricks to help you make your office feel bigger and consequently you employees will work harder and happier. Step 1: Looking for the right furniture! Avoid heavy, weighty furniture that eats up too much of the usable space in the room. For example, some chairs in the waiting room will give you as much sitting space as a spacious sofa but will take up much less of your room. Step 2: Arrange your furniture to the optimum! When dealing with a small room, many people want to maximise the space by pushing all the pieces to the edges. But shoving furniture against the wall doesn’t guarantee a larger room. Sometimes it is better to group the furniture on one side of the room, so people can pass through unhindered. Step 3: Do it bright! We all know that different colours can affect us. For example blue has a calming effect and yellow is known for energy and happiness. When choosing colours for your office, it’s important not only to pick based upon on how it could affect your workforce but how it makes the actual room feel. As you know, lighter colours make a room feel bigger, darker smaller. So try to use light colours such as white, cream, pale greys or ice blue to keep the room fresh, light, airy and open. If you have any wall space left, consider using mirrors to help the office feel bigger and deeper than it actually is.They not only reflect light, they also reflect the view, thereby tricking the eye into perceiving more space. So mirrors are an easy way to make your office appear larger. Always keep clear of your clutter. It’s usual that piles of paper and post heap up around your desk. But it’s very essential that you keep this at bay. Be sure that post is either stored away or shredded and that all other items are put away after use. If possible store certain documents online or save them on USB sticks or hard drives. That will free up space. While the technical progress increases constantly, flip charts fall more and more into oblivion. But they are more than just relics. Flip charts are still the most effective presentation media of all. Usually, the simplest visuals are the best because you always have to remember that your visual aids should just enhance your presentation and that’s what flip charts do in the easiest way. Often when high-tech computer generated presentations were used, they become the presentation and not the speaker. And that’s very dangerous for a successful presentation. It’s important to remember that you should be the biggest part of your lecture and not your visual aids. However flip charts offer more advantages. They are low tech, reliable and don’t require any special skills to use them. The first thing you should do is the planning of how your flip chart pages should look. Usually, one idea per page works the best, so don’t try to fit lots of ideas and diagrams onto one page. When you prepare your pages, it is advisable to first design them on paper before drawing them on the actual flip chart page. Be careful when writing words on the flipchart, make the letters large and clear enough so people at the back can read them. Moreover, not everyone has the gift of really neat handwriting, so write your text lightly in pencil first before using the actual flip chart markers. The second thing that makes your flip chart presentable is using colours, diagrams and pictures. Graphics and pictures allow you to communicate your message more effectively and make difficult topics clearer to the audience. You should draw some, even if you are not an artist. It’s easy – you could do it the same way like the writing – just sketch them in pencil beforehand. You don’t have to do it freehand style. Using one dark colour and one light colour works best. The reason for using dark colours like black or blue is that they maximise visibility all the way to the back of the room and can be seen from a large distance. Light colours like orange or red can be used for highlighting your flip chart content, for example, circling or underlining. When using multiple colours, try to limit the variety to two or three colours per chart page. The third and last thing is to be prepared for your own presentation. Before you are going to hold your lecture you should check the position of your flip chart to maximise visibility for your audience. Make sure every word you wrote on the flip chart can be read in the back row of the room. Moreover, check that all of your markers write well and that you have the expected number of flip chart pages. Another tip is to use pads with perforations at the top. They allow easier removal of the sheets and don’t cause a struggle to tear them off. The difference in these shredders is the level and intensity of jobs that the shredder faces. Most offices will find that an office shredder may work for their shredding needs. Yet, many corporations have commercial shredders that are meant to handle large jobs. There are also several different blades that these shredders come equipped with, that defines just how secure these shredders are. These are levels 2 through 6. The higher the level, the more shredding in which the shredder will perform. For the most part, an office is going to want to go with a higher level of shredding to ensure all their information is safe. For those who may be thinking that a shredder is not something that they need for their office, they need to consider the benefits of having one of these. For one, shredders provide a sense of privacy that is hard to find with other types of technology. When the paper is put through a shredder, it is no longer going to be the target for identity thieves, an important concept to offer potential clients. Secondly, paper shredders can also help the office to become greener. The paper that is shredded can be recycled into new products, making these a great green option for those who are trying to be more environmentally safe. With these benefits in mind, most people wonder what type of shredder they should buy. One of the first factors to consider is just how much shredding you plan on doing? For those who are going to use this every day, a personal shredder is not going to fit the ideal. Instead, an office shredder like the Fellowes DS-1200Cs Deskside Shredder can handle the job level, while also providing a great level of security. For those who plan only on using their shredder once a week or less, then a personal shredder like the Fellowes M-7C Cross Cut Shredder will be sufficient.